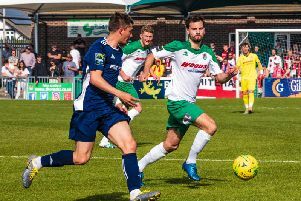 Dan Simmonds’ double delivered a win for Pagham against K Sports as the Lions reached the preliminary round of the FA Cup. For long periods in the first half, the visitors were the better side. K Sports carried on where they left off, after pulling back from 2-0 down to draw 2-2 in the first game. Time and again the Paperboys attacked the Lions goal, with James Binfield at his best to deny James Shield among others. Just after the quarter-hour as K Sports’ Jason Perry was booked following a foul on George Gaskin. The visitors’ vocal managment made their feelings known, a theme they’d keep up for most of the game. Twice around the 24th minute the visitors could have scored, first having a shot saved and hacked off the line, then seeing the rebound cleared from danger. A corner saw the visitors strike one over the bar, while at the other end a rare Pagham attack saw Howard Neighbour head straight at Paperboys keeper Adam Highsted. The visitors pressed from the off after the restart, again Binfield being at his best. James Alderman was keeping Pagham’s defence busy. Against the run of play, the Lions scored first. Simmonds collected a cross and converted to give Pagham a 55th-minute lead. A scything tackle by K Sports’ Ashley Cooper on Callum Overton bought a booking. On came Ryan Cox for Mitchell Hand before Simmonds tried his luck, a snap shot at Highsted coming to nothing. With Neighbour injured, Jamie Horncastle came on for Pagham on 65 minutes. Cox was influential, sending Simmonds through on 73 minutes. His shot hit the bar. A few minutes later Overton went on a mazy run to goal. Up popped Tom Carr to block him. Pagham skipper for the night Ryan Davidson was at his best with a timely clearence on 79 minutes. Simmonds shot into the side netting as Pagham looked for a second. K Sports thought they’d scored with three minutes left, only for the officials to rule the ball hadn’t crossed the line. But the ball did cross the line into injury time as Simmonds doubled his tally to put the result beyond doubt. The visitors didn’t give up as Alderman again tested Binfield. Simmonds was booked for ambling off too slowly when being substituted. Pagham: Binfield, Wiggans, Hand (Cox 60), Davidson, Wollers, Chick, Van Driel, Neighbour (Horncastle 65), Gaskin, Simmonds (Miller 91), Overton. Subs: Bingham, Murfin.